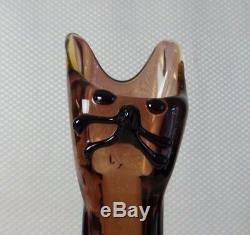 You are looking at a Rare Vintage Murano, Venice Brown Art Glass Cat Figural Vase - Fortunoff. 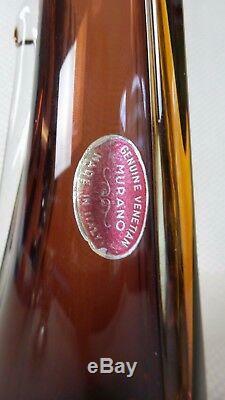 Produced in the mid 20th Century in Murano, Venice, Italy and distributed by famous design store FORTUNOFF. A lovely representation from a great glass artist featuring very attractive vintage blown brown glass Condition is excellent with no faults. Looks stunning when illuminated from below The cat is approximately 14" in height and 3.5" in width. The piece still carries the original sticker label on the side and on the bottom. A very rare Murano art glass piece that would make a great addition to your collection! The item "Rare Vintage Murano, Venice Brown Art Glass Cat Figural Vase Fortunoff" is in sale since Friday, September 8, 2017. This item is in the category "Pottery & Glass\Glass\Art Glass\Italian". 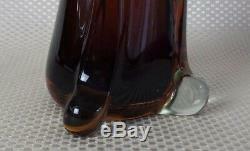 The seller is "quetzalpapalottl" and is located in Miami, Florida. This item can be shipped to United States, Canada, United Kingdom, Denmark, Romania, Slovakia, Bulgaria, Czech republic, Finland, Hungary, Latvia, Lithuania, Malta, Estonia, Australia, Greece, Portugal, Cyprus, Slovenia, Japan, China, Sweden, South Korea, Indonesia, Taiwan, South africa, Thailand, Belgium, France, Hong Kong, Ireland, Netherlands, Poland, Spain, Italy, Germany, Austria, Israel, Mexico, New Zealand, Philippines, Singapore, Switzerland, Norway, Saudi arabia, Ukraine, United arab emirates, Qatar, Kuwait, Bahrain, Croatia, Malaysia, Brazil, Chile, Colombia, Costa rica, Dominican republic, Panama, Trinidad and tobago, Guatemala, El salvador, Honduras, Jamaica, Antigua and barbuda, Aruba, Belize, Dominica, Grenada, Saint kitts and nevis, Saint lucia, Montserrat, Turks and caicos islands, Barbados, Bangladesh, Bermuda, Brunei darussalam, Bolivia, Ecuador, Egypt, French guiana, Guernsey, Gibraltar, Guadeloupe, Iceland, Jersey, Jordan, Cambodia, Cayman islands, Liechtenstein, Sri lanka, Luxembourg, Monaco, Macao, Martinique, Maldives, Nicaragua, Oman, Peru, Pakistan, Paraguay, Reunion, Bahamas, Viet nam, Uruguay.